We got a late start (for us) heading out of Timothy lake around 9:52, because we were extra careful to double check everything before pulling away. 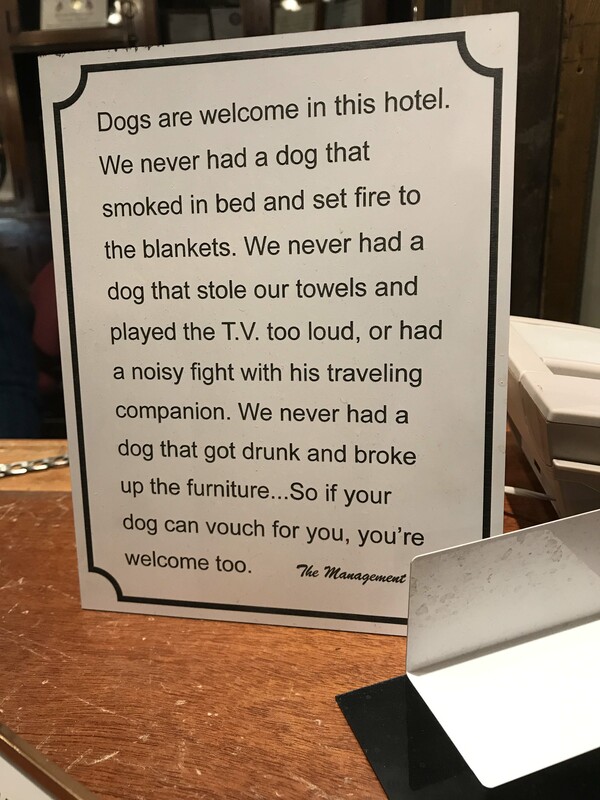 One thing we have noticed is the longer we stay in a place the more likely it is we will forget something when we leave, and we wanted to make extra sure that didn’t happen to us again. Just a few days prior Lee had noticed that two of the nuts which secure the bolts which hold the hitch rails to the bed of our truck were missing. That was a little scary, especially coupled with the fact that the other bolts were very loose, and really drove home the fact that we need to be checking these things. Lee was able to pick up replacement nuts at the hardware store, and thankfully everything else looked good and we were on our way. It was raining as we pulled out, and the trees were full of autumn colors, so it was a little surprising how quickly the landscape changed. 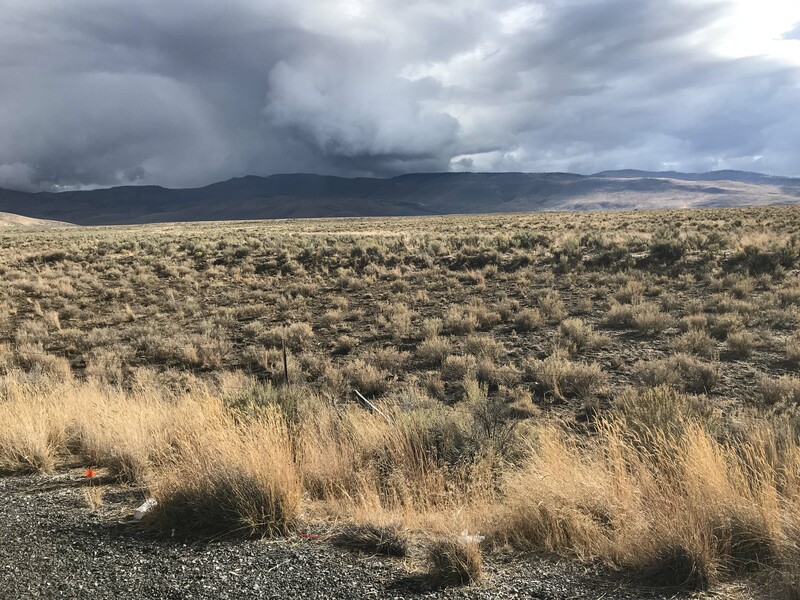 In what seemed like no time at all we were in the high desert, although we didn’t leave the rain behind. I know I’ve mentioned this before, but when time allows we love to take a route we have never been on before. In order to manage this I carry a Rand McNally Map which I use to mark the routes we are taking. I am in year 4 of doing this, and over the summer I actually bought a new one and took the time to refill in all of the colors over the last few years. The exercise, which took a while, showed me two things. We had been in a lot of places, but there was still so much more to see! 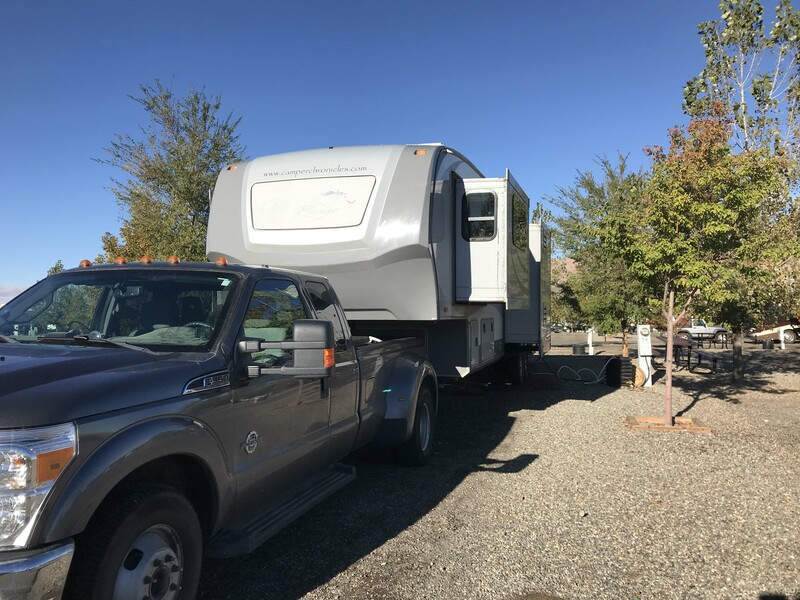 Because we had time, I decided to route us on a road less traveled and we took 95 down to Winnemucca and stayed at the New Frontier RV Park. 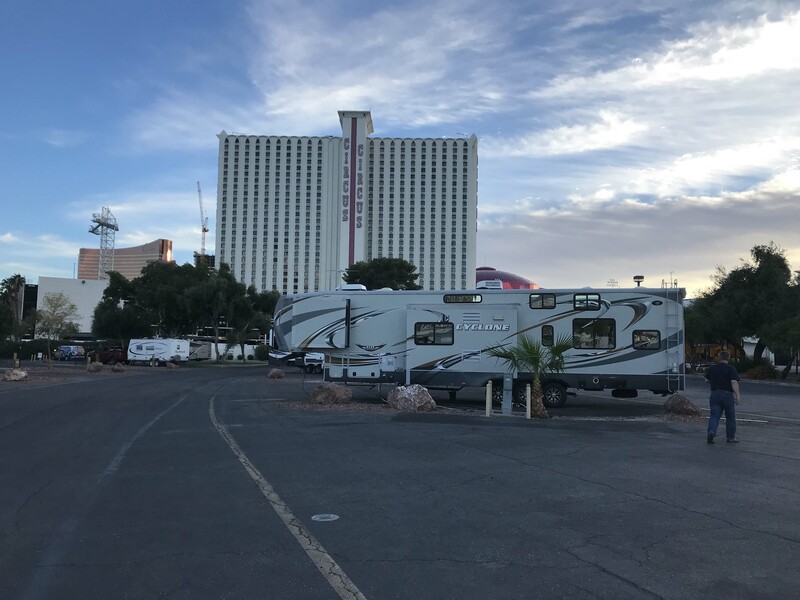 We have stayed at this RV park before when we were traveling through and it’s definitely one of my favorite Passport America parks. $17 for up to two nights, neat as a pin, and the sites are long and level. The only downside is to get the discount you have to take a back in site and because we didn’t like the first place we had stopped at it was dark when we got in. We rarely pull into a place at night and if we do we usually get a pull through so don’t have to back in, but Lee was a trooper and did an outstanding job of getting us into the site. I stood and held the flashlight as a point of reference for him, and with minimal effort he got us in. Still amazed by it, because that is definitely not something he would have done even a couple of years ago. So you could see how good a job he did! The sites are long but a little narrow. 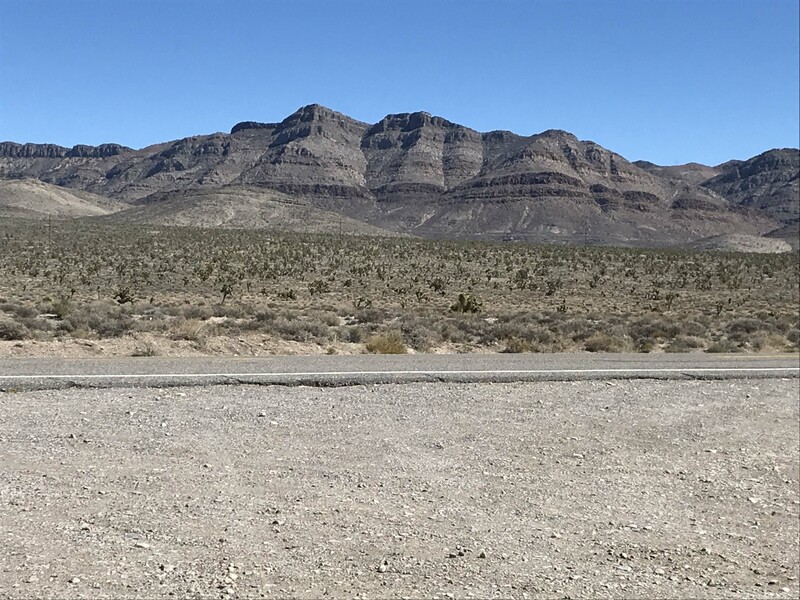 Lee is also much more comfortable driving on secondary roads now (he was always super concerned in the past about getting fuel and other potential problems), so he was up for us taking a route that would land us on the extraterrestrial highway and into Area 51. I like filling in my map…it makes me happy, but I will say some roads are less traveled for a reason. Route 6 and Route 375 are both pretty boring and although we were able to find gas, there were VERY limited options on places to stay. Well, let me rephrase that, there were tons of places we could have boondocked, but places with hookups were much harder to find. 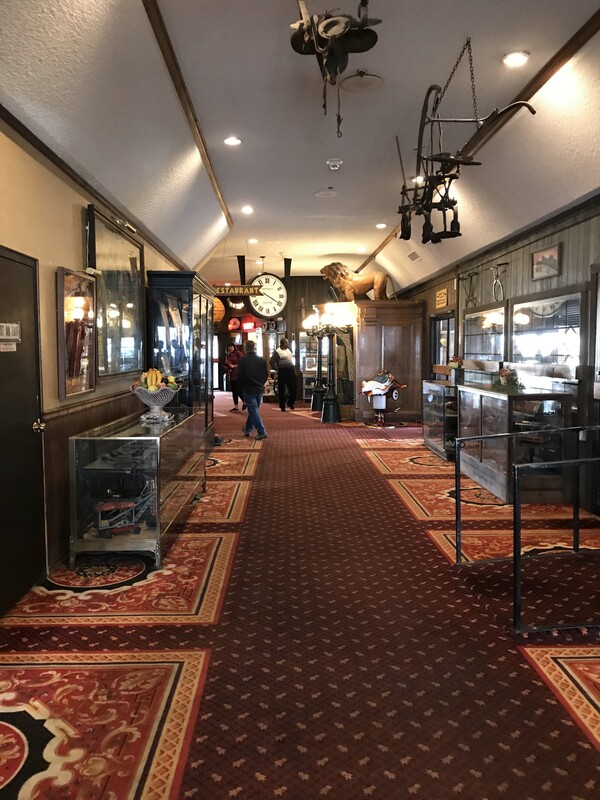 Ultimately we ended up spending the night at Tonopah Station, which was a casino with some hookups. Why did we spend $27 instead of boondocking for free? 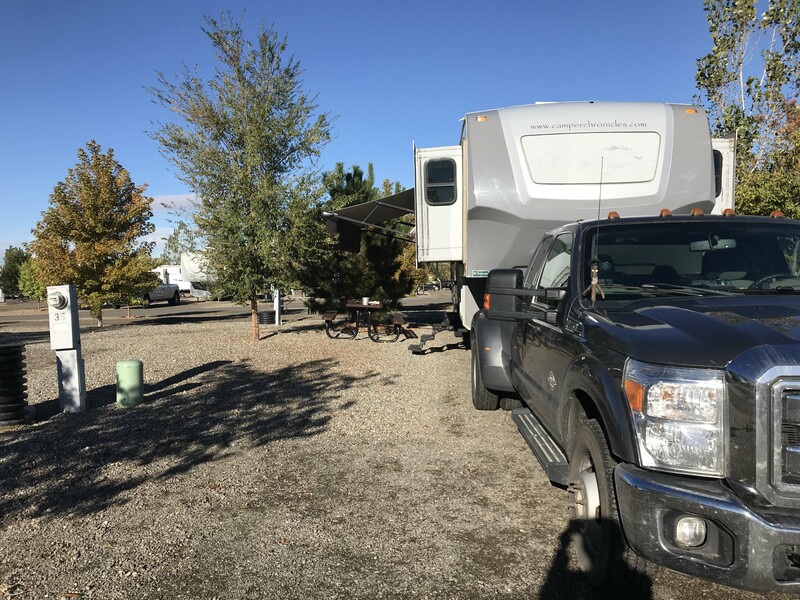 Well, finding a boondocking spot we feel comfortable staying in takes some effort and it’s never Lee’s first choice when we are traveling, and it’s an overnight spot. Since he does most of the driving, I feel like it’s dealer’s choice, so I make use of Passport America to keep our costs down. Unfortunately the one park in the area that was Passport America was super shady (that happens on occasion) and the casino was the best of several bad choices. 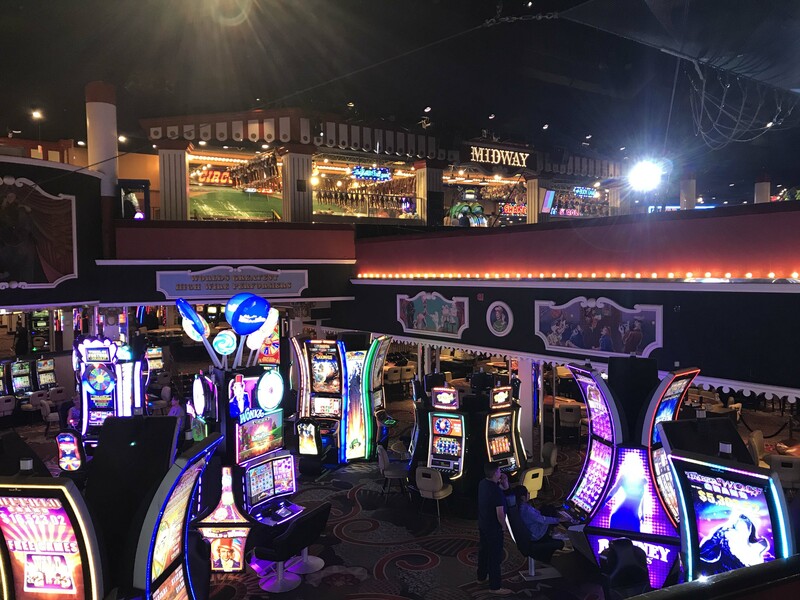 I have very mixed feelings about this location, because I thought the casino itself was kind of fun and the people were nice. 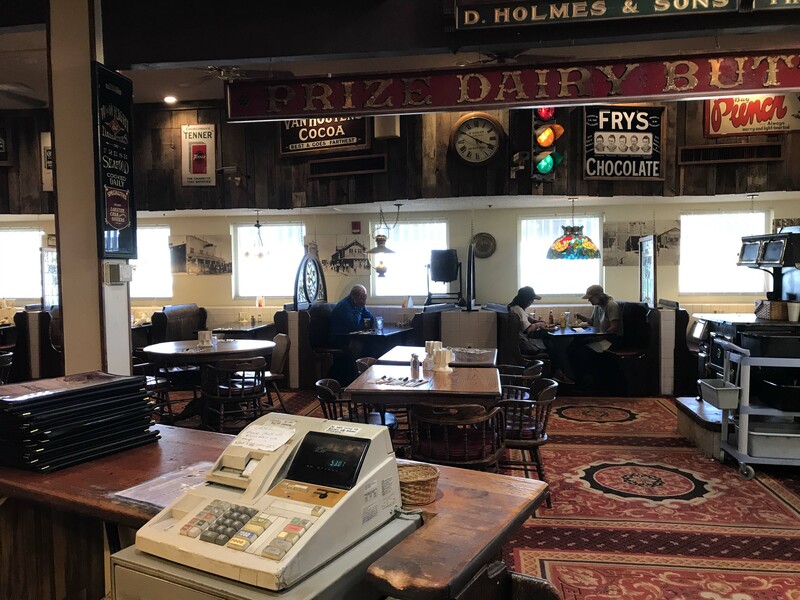 There was also a great local grocery store that was part of the casino complex and we had a nice breakfast at the restaurant. The problem was the sites. I can deal with being in a parking lot, but the sites were very unlevel. One of the few benefits of the parking lot structure generally is flat sites, but these were uneven and too short. That was a major flaw in my mind. 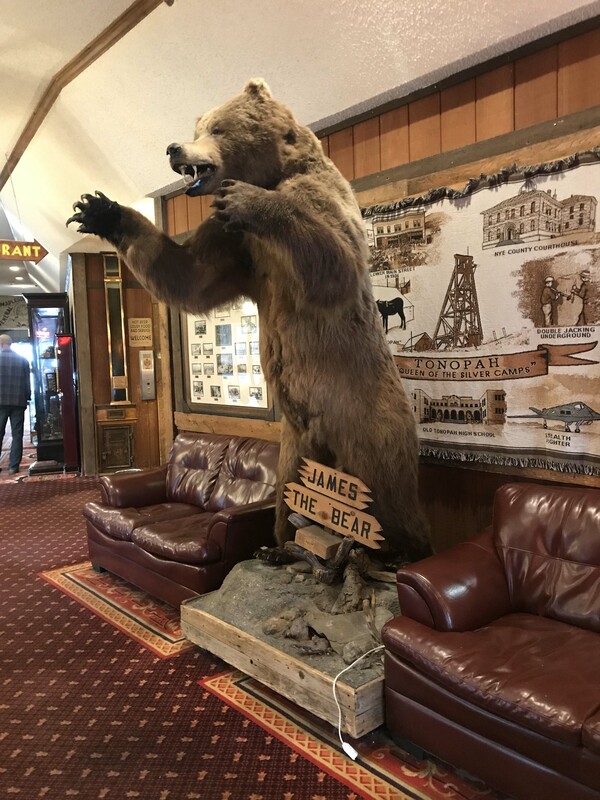 Lee refused to pose under this bear! 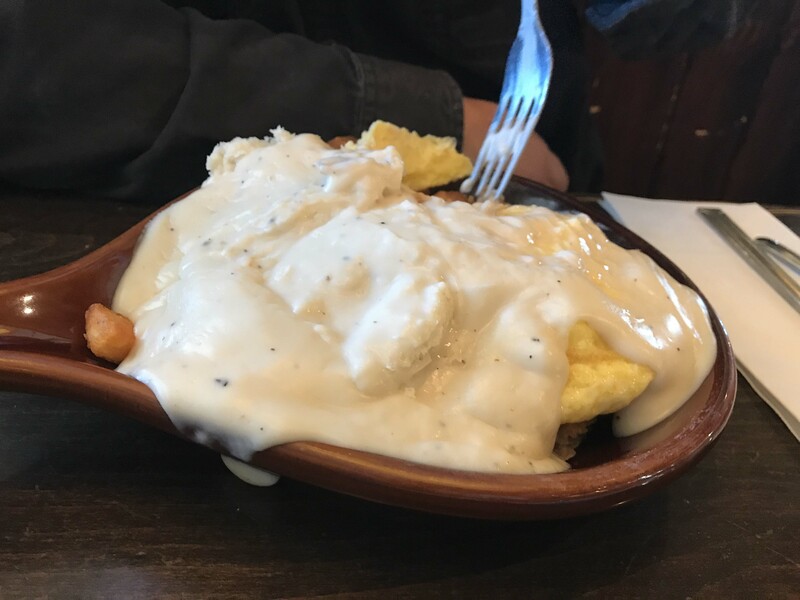 A mound of country gravy smothered scrambled eggs, potatoes, diced country fried steak, and a biscuit. Lol..Lee really liked it! The site though was just not good. Significant down slope. It was OK for one night and the next day we took our time leaving, because we had a pretty short drive to Vegas. 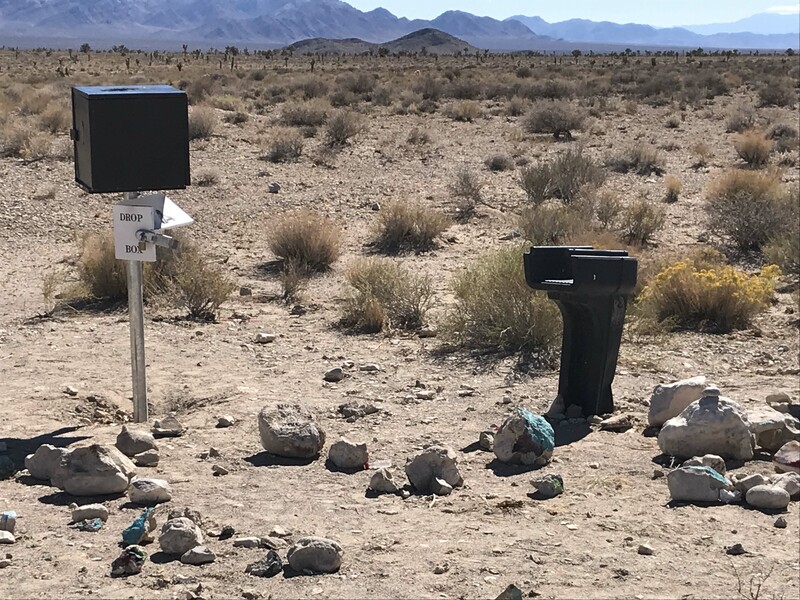 I was excited about the extraterrestrial road, but that turned out to be a total bust. 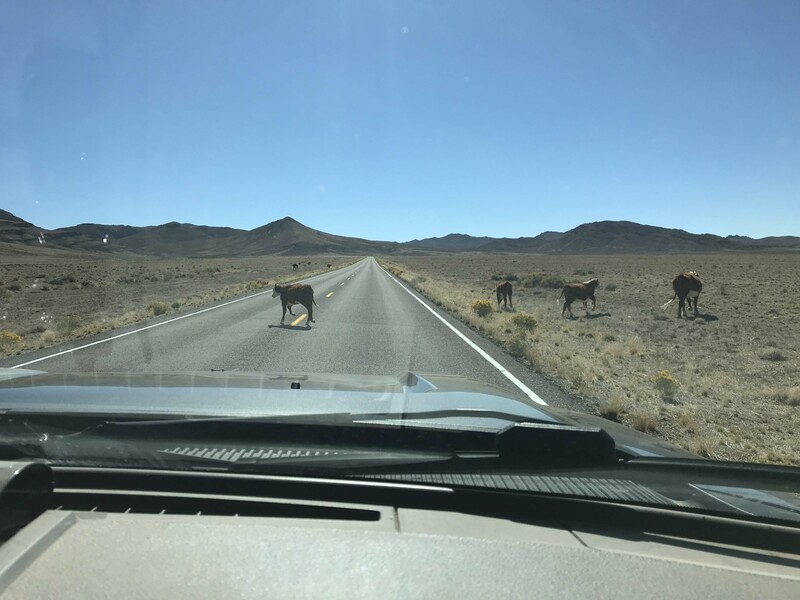 It was open range cattle country for one thing, and on occasion we had to slow down for the cows. 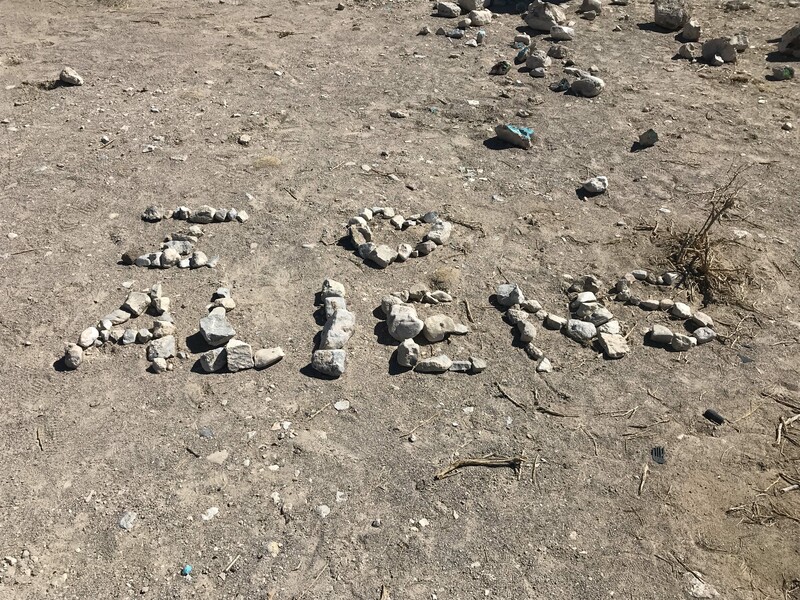 And we saw very little in the way of kitschy stuff, although we did see a few signs saying this was Area 51. There was also a paved road with a sign stating Cedar Gate, which I later learned was an entrance to a military facility. Still you really can’t see anything, although I guess these landscapes were used frequently in the show the X-Files. The rocks got pretty towards the end. We were both relieved when we got onto 93, although of course I took a turn driving right when we hit a 6 mile stretch of 35-mile an hour curves and 6% grade. It was good practice for me and Lee talked me through it, but once he took over it was totally flat again…figures! The one neat thing we saw was the Pharaganat National Wildlife Refuge. 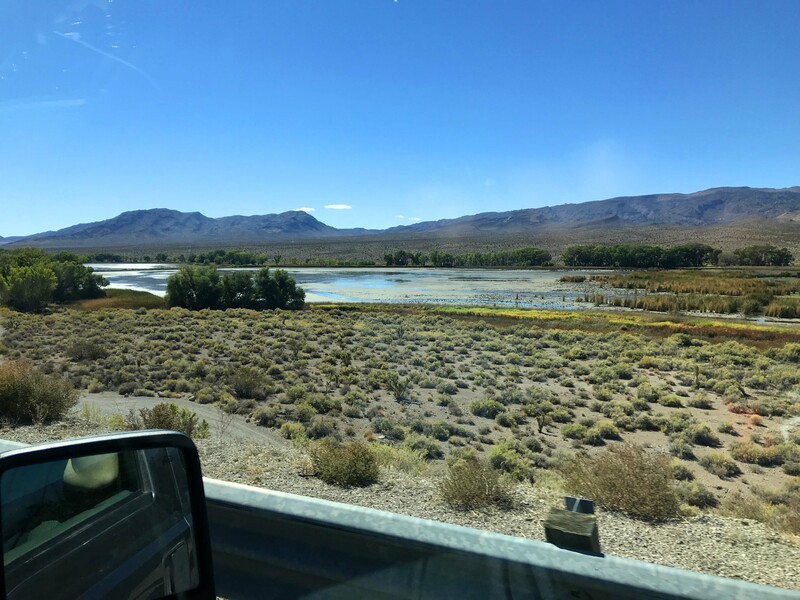 It was a shock of green in the middle of the desert and we were excited to see that the Upper Pharaganat Lake had 15 first come first serve (and free) campsites along the lake. These sites were holding big rigs and it looked lovely. Definitely a place I would like to go back to and stay! 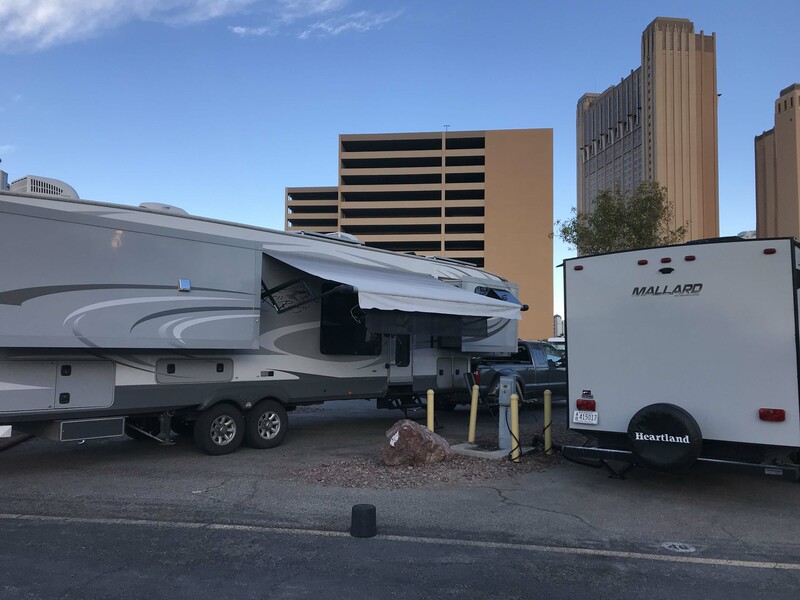 Finally we arrived in Vegas around 3pm and made it with no major traffic issues to Circus Circus RV Park. This is definitely NOT my favorite place to stay in Vegas, but Lee loves staying right on the strip, so here we are. 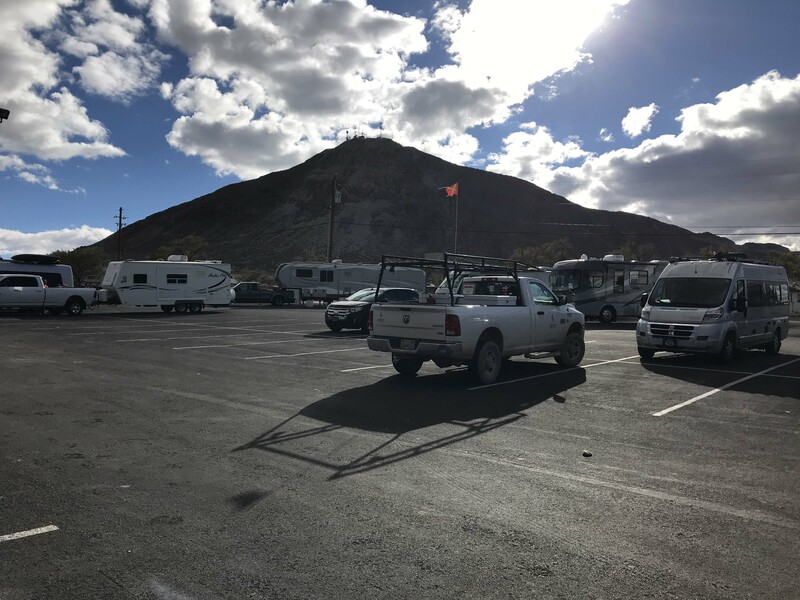 It is also a parking lot RV Park and a pricey one at that, but I will say they had done a better job of maintaining the grounds since the last time we were here, although I did find a pair of men’s underwear in the rocks next to our site. I picked them up with a baggie and put them in the trash, and it was not an auspicious start to our time here. Seriously, people. We went inside and the tinkle of the slot machines caught my attention and we ate some McDonald’s for dinner (yes, there is one in Circus Circus) and caught the circus act which lasted all of 5 minutes. Crazy right? Well, this is what Vegas looks like on a budget. 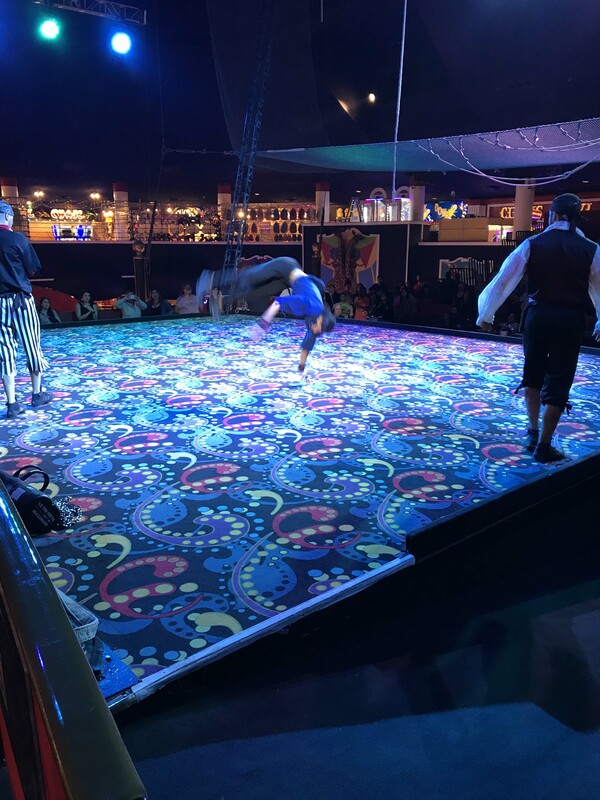 Next up we will see my Mom and maybe do some fun things while we are here, but it is a balancing act for us (no pun intended) because this is our life, not a vacation. Well it’s sort of vacation because we aren’t working, but we need to watch what we spend…oh well, we will figure it out. Our spot in the RV park. The sites are long but narrow. 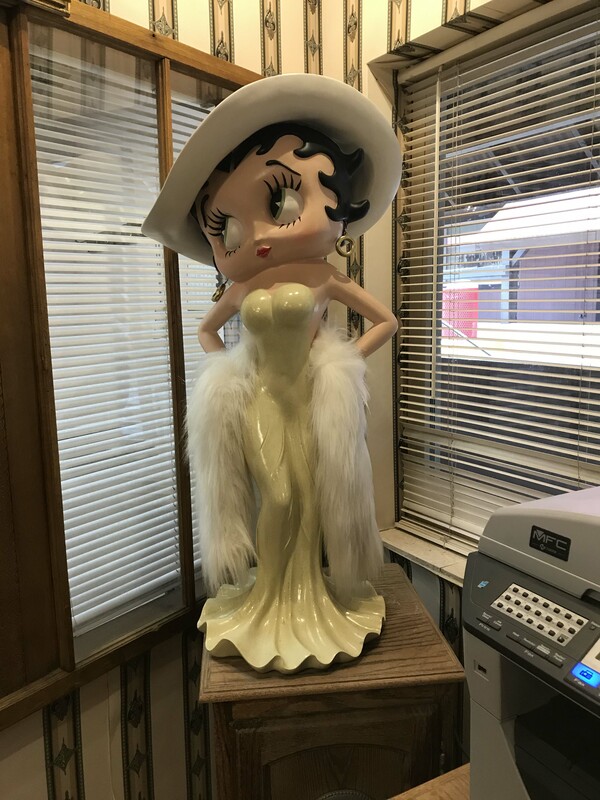 This entry was posted in Lakeside and tagged Area 51, Circus Circus RV PArk, Extraterrestrial Highway, New Frontier RV Park, Tonopah Station, Upper Lake Pahranagat National Wildlife Refuge. Bookmark the permalink. Could you provide the company address for applying for camp hosting for next summer? I’ve done in previous years and now may be interested in working again in the forests such as your campgrounds. Thanks for any info. You can email them at PGEParks@Pgn.com.